The plot follows Juan “Johnny” Rico, a young man from a wealthy civilian family who joins the Mobile Infantry. The infantry uses advanced combat spacesuits that also double as portable artillery units (including tactical nukes). Johnny goes through basic training and is thrust into a real war when a race of alien bugs attacks Earth. While some critics have alleged that Heinlein uses the novel to preach the virtues of nationalism or fascism, the book is actually much more sophisticated. Heinlein raises important questions about citizenship and responsibility. One of Johnny’s professors tells his class that the democracies of the 20th century collapsed when they promised citizens too many free services and public goods (ironically, not too different from Mitt Romney’s infamous critique of the Obama administration after the 2012 election). Notably, the professor does not disparage other forms of government, but merely reflects that the current system seems to work best. Throughout the book, we see characters struggle with difficult decisions about sacrifice and duty. Should the military continue a war in order to rescue 1,000 prisoners – or even a single prisoner? To what extent is it fair to enact draconian punishments in order to teach people lessons? These questions go beyond a simple dichotomy of democracy versus fascism and raise deeper questions about how and when the ends justify the means. The story has an additional layer in the interaction between the idealism of military service and the reality of military politics. 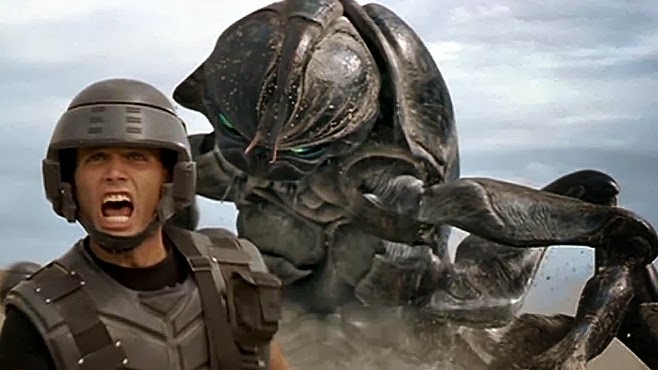 Starship Troopers is told in first-person perspective, from Johnny’s point of view. He’s gung-ho about the Mobile Infantry and becomes an enthusiastic supporter of the system. The narration perfectly captures the voice of a wide-eyed, young military recruit (Lloyd James does a great job in the the audiobook narration as well). I really felt like Johnny was telling me about his adventures over a pint of beer. However, as readers, we have a sneaking suspicion that Johnny is being manipulated by “the system.” There are several instances in which Johnny learns that he had been tricked, yet he seems willing to rationalize the deception as necessary for the greater good. In a remarkable feat of storytelling, Heinlein uses first-person narration yet doesn’t force readers to accept a particular point of view. At the end of the book, I wasn’t sure if Starship Troopers was intended as an endorsement or spoof of militarism. Unfortunately, the 1997 film adaptation was much less subtle, but not without its merits. Overall, Starship Troopers is an exemplar of how science fiction can be used both to tell exciting stories and to raise important political questions. Whether or not you agree with Heinlein’s views or respect the type of society he’s constructed in the novel, the book will challenge your assumptions about the role of citizens in a democracy. My second favorite book of all time. First book I ever read in 1st person that was worth anything. Thanks for the review. The cover you have is the same as the copy I first purchases in the 90s. Sweet! Great review. It infuriates me when people dismiss it as Heinlein supporting fascism. I read this a few years ago, but am currently working my way through Heinlein’s works and this one should be up for re-consumption later this year. Thanks! I really need to read some more Heinlein. One day… Of all the Golden Age sci-fi authors, his work has probably aged the most gracefully.